Notes: The Williamsburg Bridge began construction in 1896 and was opened to traffic in 1903. 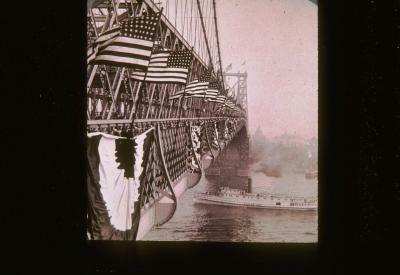 The bridge was constructed to ease traffic and congestion on the Brooklyn Bridge. Economic considerations were paramount in the selection of the design and light steel components were chosen for the towers to reduce costs. The bridge originally supported six rail lines with four lanes of traffic. The bridge fell into disrepair by the 1980s and starting in 1991 was treated to a $1 billion restoration effort.